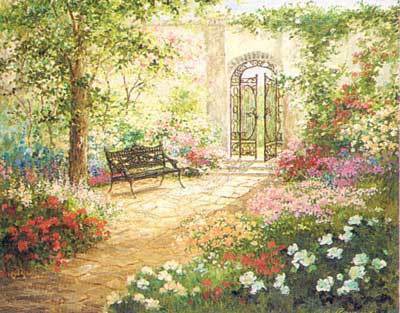 Beautiful Secret Garden. . Wallpaper and background images in the Daydreaming club tagged: daydreaming fantasy garden fairytale. This Daydreaming photo contains flowerbed, flower bed, bed of flowers, red maple, scarlet maple, swamp maple, acer rubrum, and red oak. There might also be sugar maple, rock maple, acer saccharum, japanese maple, acer palmatum, beech, and beech tree.